Chelmsford, Mass. – August 14, 2018 –Broadcast Pix will introduce BPswitch™ RX, a portable model in its popular line of integrated production switchers, at IBC2018 (Hall 7, Stand C06), which runs Sept. 14-18 at RAI Amsterdam. A self-contained unit complete with touchscreen display and integrated streaming to Facebook Live and other CDNs, BPswitch RX provides multi-camera production and high-end motion graphics for live production on location. Ideal for sports, concerts, and event coverage, BPswitch RX features four multi-definition video inputs, plus two IP inputs that support RTSP and NDI protocol. It also includes eight channels of clips and graphics, built-in audio mixer, three keyers with DVEs, and seven outputs. The integrated NewBlueNTX multi-layer 3D motion graphics CG includes hundreds of title styles and templates, so it is easy to create and update lower-thirds, bugs, animations, rolls, crawls, and looping effects like a glint or shine. 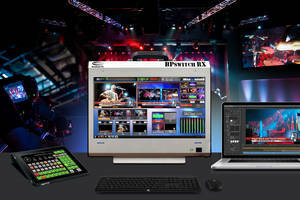 BPswitch RX offers the full complement of Broadcast Pix workflow tools, including built-in program recording, clip and graphic stores, file-based macros, ClearKey™ chromakey and Virtual Studios virtual sets, and customizable multi-view. The system is housed in a durable aluminum alloy chassis with built-in handle for easy transport. Although BPswitch RX can be operated with the included keyboard and mouse, users can connect a traditional Broadcast Pix control panel or use the optional Broadcast Pix Commander™ customizable touchscreen interface. With its simplified controls, Commander helps non-technical personnel easily switch live productions, add titles, insert clips, and control robotic cameras. The recently updated iPixPanel and iPixPad provide other control options, allowing a second operator to complete specific production tasks through an iPad or iPhone. Like other models, BPswitch RX provides full-motion video and complete access to all sources and workflow tools through a browser-based interface that can be accessed by tablet, phones, and laptops. The company’s BPNet™ IP ecosystem, powered through the ioGates cloud-based media management platform, delivers BPswitch’s control-over-IP capabilities with low latency, as well as extended encryption and two-factor authentication for secure performance. BPswitch RX supports optional robotic camera control as well as BPfusion, Broadcast Pix’s optional software for streamlined data-intensive CG graphics for sports, election, and news coverage. Broadcast Pix also offers soft and hard carrying cases for additional protection for air travel or other transport. Priced at $14,995, BPswitch RX will be available at the end of September. About Broadcast Pix With a tightly coupled switcher and 3D motion graphics CG, Broadcast Pix provides the most fully integrated live video production systems with patented control and automation technology. From compact units to large-scale, multi-system solutions, every Broadcast Pix features an extensive toolset that makes it easy to optimize and customize your workflows locally and over IP. Plus, its BPNet ecosystem provides secure cloud services and asset management. Founded in 2002, Broadcast Pix has customers in more than 100 countries and is the leader in fully integrated production switchers for government, broadcast, streaming, live event, and visual radio applications. Learn more at www.broadcastpix.com. MFR-4000 12G-SDI Routing Switcher carries 4K video using single cable. HVS-490 Video Switcher offers 4K-UHD and 3G capabilities.